This has not been tested yet, let me know if you find any mistakes, or an easier way. This took all of maybe 10 min to make.Here is the simple pattern, let me know if this is not clear, I’m not good at writing them up. Row 4: and 5 repeat row 3. fasten off. I'll have to make a few of these for my adult pirates. They'll probably wear them to the Pirate Festival in Eastport. Thanks for sharing. I need to do patch tharapy with one of my twins. Thi pattern is perfect. and it looks easy! 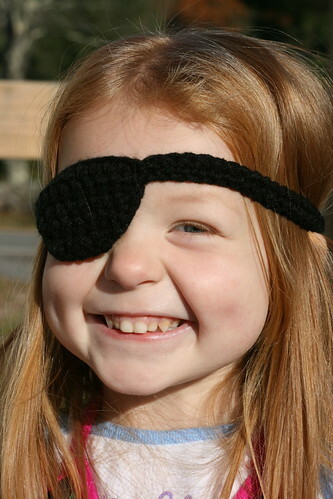 My daughter asked me to make her an eyepatch today, so that she can be a pirate. Your pattern was perfect and quick! Thanks! Fun! I wish I had found this a few days ago when I was babysitting. Oh well, I think I'll make this with two long openended straps that tie together to fit all head sizes for any other wee pirates that drop by. Thanks! This is great! My pirate lovin' boys will love this! Thanks for the pattern! thanks , just what I needed , this morning she decided she wanted to be a pirate , and this patch makes her outfit complete ! I'm doing patch therapy for my son who is 4yrs old. He doesn't like using the adhesive patches because they pull his eye brows. This is the perfect size! Thank you for sharing! Great pattern and cute model! My boys love being pirates, this pattern will be a hit for sure. I've aldo linked to it from my blog this morning for a Halloween roundup: http://www.mooglyblog.com/crochet-halloween-costumes-for-kids/ if you want to check it out. Thanks so much for sharing your pattern! Just whipped one up for my son as we are going to a pirate themed birthday party this afternoon. The pattern was great! Just wanted to add that I did the strap with a foundation hdc so that I could easily adjust the length with out having to undo the whole strap and starting over. My son was still asleep while I was making so I could not measure his head. I have eye surgery coming up in a week and a half and need to keep it covered for a few days...off to make myself one of these...so cute!!! Thanks so much for the pattern!